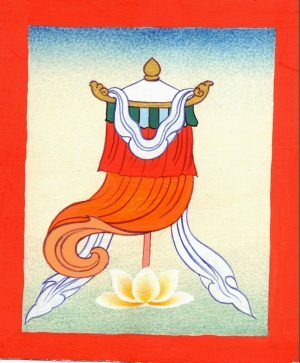 Colophon: Dictated by Kyabje Lama Zopa Rinpoche to Ven. Sarah Thresher at Root Institute, Bodhgaya, India, February 4, 2014. Edited with the help of Losang Hursthouse. 1. 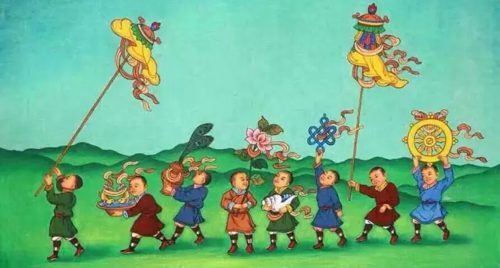 The precious umbrella saves us from all this life’s obstacles – such as sicknesses, contagious diseases, spirit possessions, interferers and so forth – and also from the next life’s obstacles – the sufferings of the three evil-gone-ones,3 of the devas, human beings and so forth. It saves us completely from being tormented by the heat of both temporary and long-term sufferings. It has the dependent arising of giving the extended joy of a cooling shadow of peace and happiness. 2. The yellow fish. Fish swim as they like without fear in the ocean. 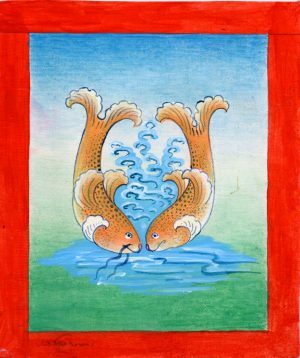 Like that [the yellow fish] is a dependent arising for oneself and others to run and enjoy freely with no resistance from happiness to happiness without fear of drowning in the oceans of suffering. 3. 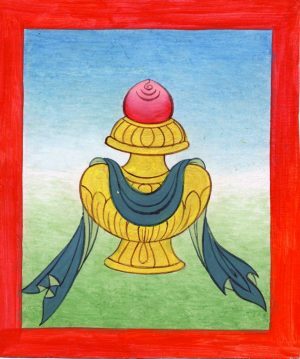 The vase of great treasure is a dependent arising that brings unceasingly all desired things, the fortune of a glorious life, enjoyments and so forth in the three realms of existence (the desire, form and formless realms) and peace (liberation from samsara). 4. The lotus is a dependent arising that frees us from all the stains of mistakes – the non-virtues of body, speech and mind. 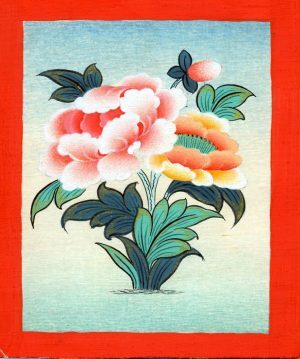 The abundant blossoming of a hundred petals of white virtue brings an abundance of the good essence of honey – everlasting happiness, definite goodness (liberation and the state of omniscient mind). 5. 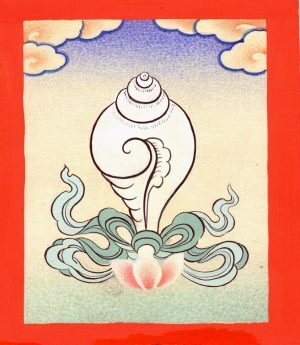 The white conch shell swirling clockwise is a dependent arising announcing the sweet melody of the profound and extensive Dharma that fits the elements, level of mind and wishes of sentient beings who are the objects to be subdued. It awakens transmigratory beings from the ignorant sleep of unknowing and persuades them to accomplish works for the benefit and happiness of themselves and others. 6. 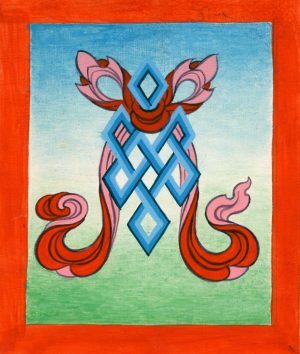 The glorious Knot, peu is a dependent arising for Dharma and politics to utilize and support each other in one continuous connection. Like that, at the time of the path, method and wisdom connect by being unified with each other; emptiness and dependent arising are connected in one without contradiction. 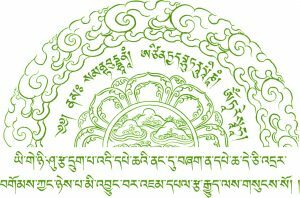 At the time of the resultant state of buddha, omniscience and compassion are unified. 7. 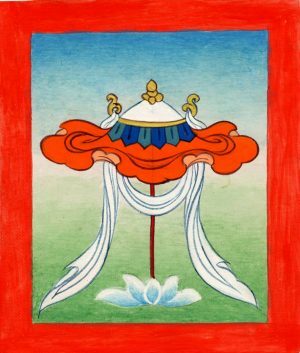 The banner is a dependent arising for the activities of one’s own three doors and those of others not be stepped upon by obstacles or disharmonious conditions but to be victorious and for the precious teachings of the Buddha to be victorious in the war over the black side, the types of maras. 8. 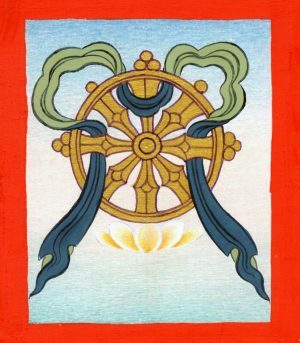 The golden Dharmachakra is a dependent arising for the precious wheel of the holy Dharma, the scriptures and realizations of the Victorious One, to turn unceasingly in the whole universe. In dependence upon that, all those who are reborn and degenerating (samsaric beings who are continually being reborn and dying under the control of karma and delusion) apply themselves to the most glorious virtue, total liberation.